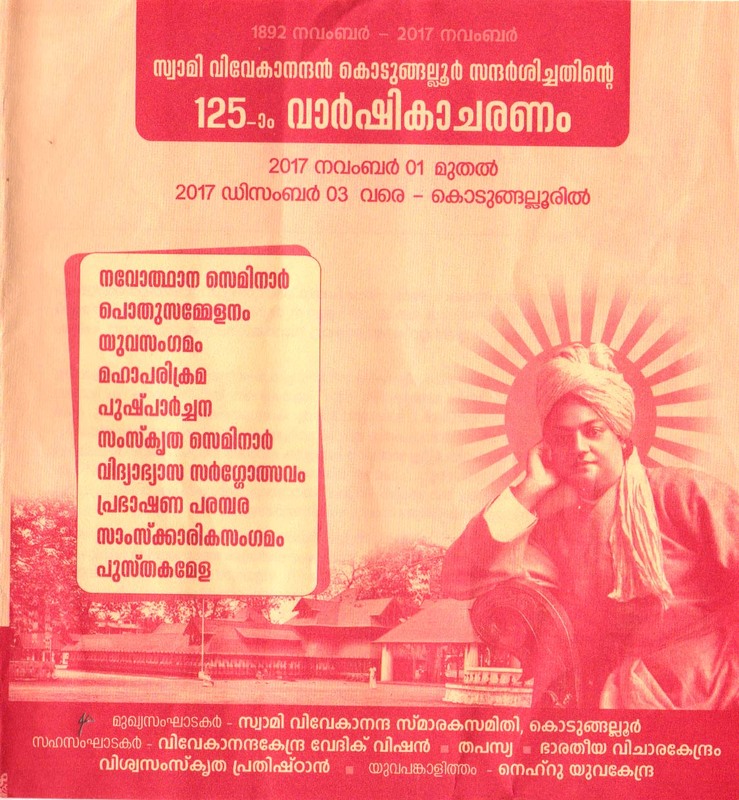 In order to celebrate Swami Vivekananda's 125th year of visit to Kodungallur, a committee 'Swami Vivekananda Smarak Samity was formed by the like-minded Hindu organizations of Kodungallur. Mananeeya Lakshmi Didi was made ONE OF the patrons A month-long programme from 1st November to 3rd December, mainly consisting of a series of competitions for the school children from LP level to Higher Secondary level and also for the youth was chalked out. 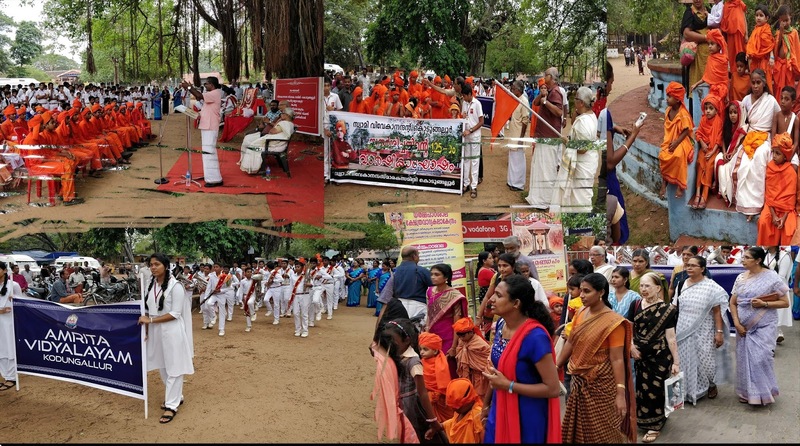 To coordinate in the conducting of the various programmes, Vivekananda Kendra Kendra Vedic Vision Foundation, Tapasya, Bharateeya Vichara Kendram, Vishwa Samskrta Pratishthan and Nehru Yuva Kendra also participated. 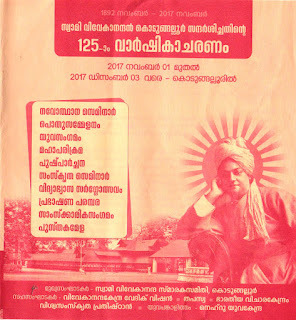 Apart from competitions, a seminar in Malayalam and Sanskrit, Yuva Sammelan, Parikrama and Pushparchana and various other programmes were conducted. 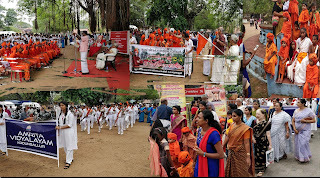 School children many of them dressed as Swamiji took part in the Parikrama programme. After offering flowers at the feet of Swamiji (Photo), there was parikrama of the Bhagavathi temple from outside. Amrita Vidyalayam children had their band troop also. Sandeepani Sishuvihar LKG and UKG students also took part. 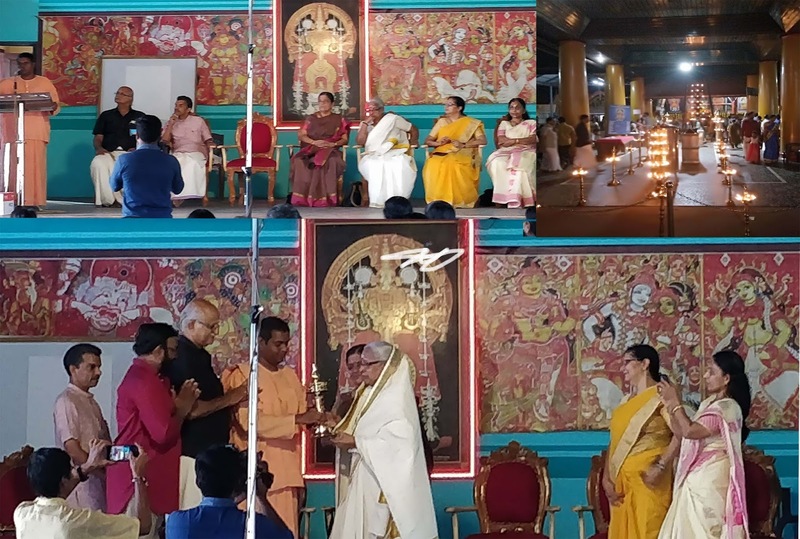 The month-long programme came to an end with the concluding programme held at Navaratri Mandapam, Kodungallur on 3rd December, Kartika Pournami evening. In the presence of the General Convener and Chairman of the Swami Vivekananda Smarak Samity Sri D.Sundareshan and Sri M.P. Venugopal, and other members of the team including the audience, Mananeeya Lakshmi DIdi was felicitated by Rev.Swami Nandatmajanandaji, editor of Prabuddha Keralam-Ramakrishna Math Thrissur who was also one of the patrons of the above Samity. Prize distribution and talks by Sri K.B.Surendren of Bharatiya Vichar Kendra and Rev Swami Nandatmajanandaji, Smt Saraswathy -principal of Bharatiya Vidya Bhavan-Kodungallur, formed part of the evening programme.